I am loving your Geronimo Creek pages, elaynef. Good to see summer! That ep line is perfect for these photos. I love how you have photos of all the action. I apologize for not commenting on your pages thus far....I will get to that. I am enjoying all the creativity. When I retired. 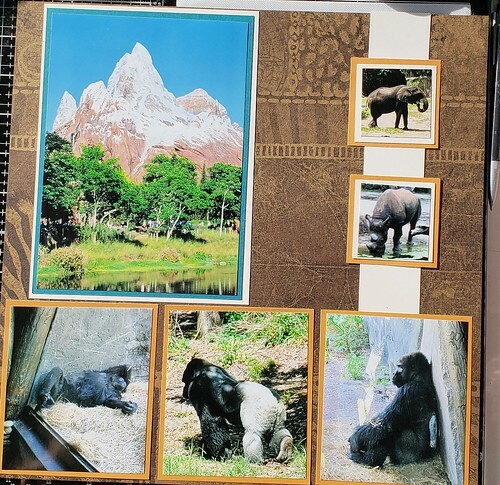 I wanted to be able to fill in some gaps in my scrapbooking. Presently, along with completing 2017 & 2018, I occasionally dip back to 2010. We went to Disney World with friends that have become our travel companions (we are presently planning a trip to Italy this fall.) This is a re-wrk of the pocket pages I did of this trip. What a great way to rework pocket pages, patin! 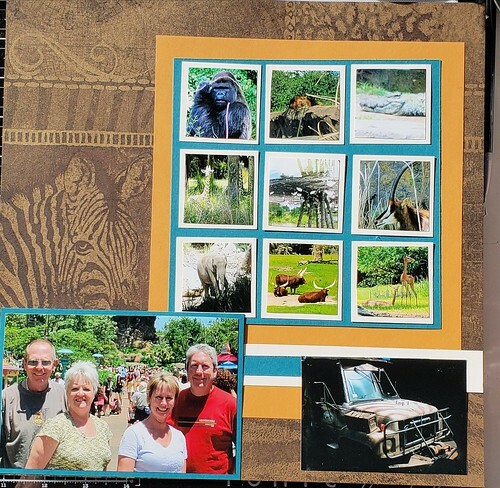 LOVE those animal print papers and what you have done with these pages. Here are my pages for today. I also created a birthday card, but can't share until it has been delivered to its recipient. 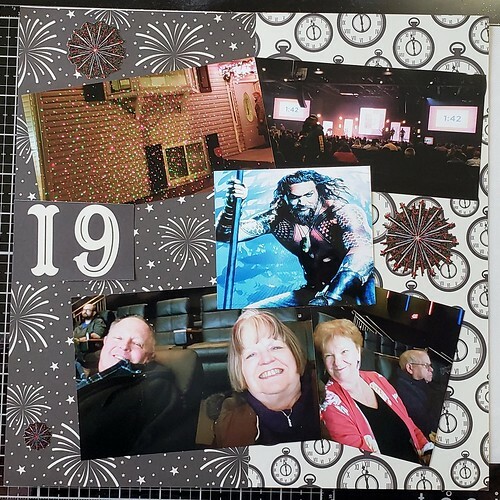 dasmith2 - yes you get points for the stash and sketch challenges (1/page/challenge) Love your layout that background is perfect! 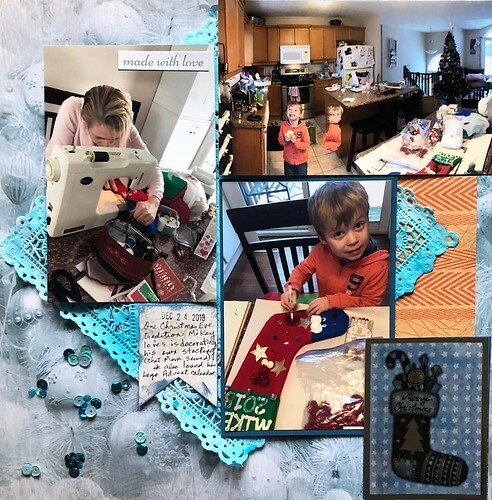 grammadee - great idea to take and scrap the decorations - looks awesome! Outing and gratitude challenges today 24 pts. Great pages, and pics as usual, Patin. It's time to start our 2019 album. WOOT! For over 30 years, we have spent New Year's with our dear friends. It was our year to go visit them for the weekend. It was filled with lots of laughs, games, Aquaman, and even got to attend Church at our old Church building that has been totally revamped by a wonderful new congregation. Another great pair of pages, elaynef. Love those fishy papers with these photos. Also love the palm tree on the journaling spot. patin, I will leave you some love on Flickr. Perfect New Years' Eve pages. Points: one page created and shared (2). January Stash challenge (doily, sequins, foiled vellum and handwriting) (1). 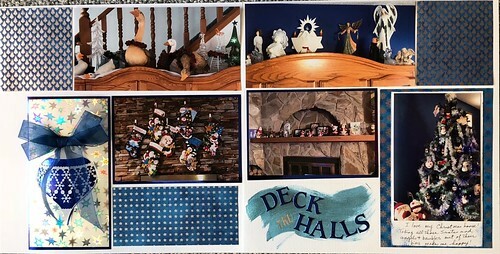 #3 rectangular photos (1). #4 square page (1). #8 two generations (2). #12 pp background (1). #23 at least 3 manufacturers (1). #30 date stamp (1). #31 three photos (1). #37 jurnaling (1). #51 ink splatters (1). Total: 13. Congrats on finishing Christmas, grammadee. Beautiful as always! I will be back later to leave comments. This page is loosely based on 12 Days of Christmas #6 swirls. 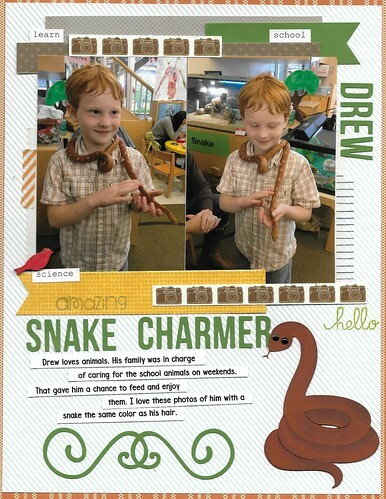 I found these photos of Drew and thought, they would be perfect for snaky swirls. Points listed on other thread. dasmith2, congrats on your first 2 pages for this month. I love that multicolored brick paper you used. Did you ink it that color? So cool. elaynef, I love the fishie paper you used on your pages. That park looks so beautiful and green and lush. (Even in the rain). What a wonderful place for a boys’ day out. Love your design and your colors and the cute little palm trees. ~ Your Hiking Adventure pages are so interesting. What an fascinating water pump. I’m glad you included the science behind it. Great job on that creative title. Love this. grammadee and patin, I’m heading over to leave you some love in the gallery. I wish I could take credit for it 😅 but it’s all pp. Its from Ella &Viv, I picked up a couple of patterns. I really like them! I'm hoping to get back to scrapping soon, but I wanted to take a couple of minutes to leave some praise. Thanks to all of you who have been posting your challenges and your pages. You all inspire me and motivate me to keep working. Sometimes I get a little overwhelmed when I think about all the pages I want to make, but once I get started on them, I really enjoy the process. I'm really grateful to be a part of this community! 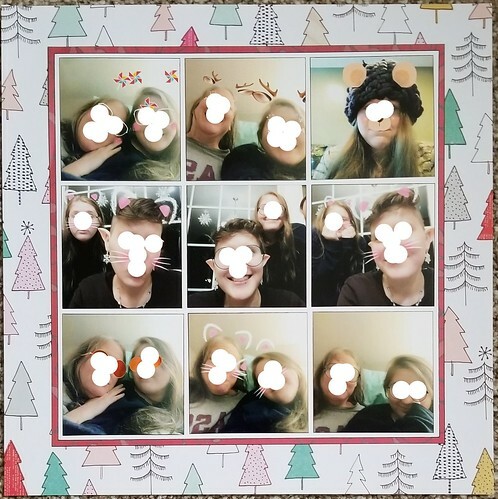 grammadee , I'm loving your gaming pages with all the white, especially the wood background on the "gift of fun" pages, and the reindeer strip on your "game on" page. It looks like a cozy sweater. 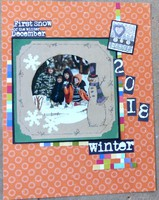 Your pages feel warm and homey even with all the white. And great textures! Nice clusters on a bunch of your pages too. The tag on your "master chef" page is fantastic! KelleeM , I adore the "me and my mom" page (what a resemblance! ), but your "6 Years" page is my favorite - your smile is just beautiful! nylene , I've really been enjoying your journaling about your childhood Christmas memories. I hope you'll continue to record your stories. And the folding cards you made for your card club - amazing! KikiPea , You got so much cool stuff on your travel page - I love it! And your puppy dogs are so adorable - great Christmas pages! AussieMeg , everything! The colors - you always choose the perfect kits to go with your photos. The textures and all the layers - you really know what you're doing. I love how you made the heart behind your diamond. elaynef , you've been really busy scrapping too! 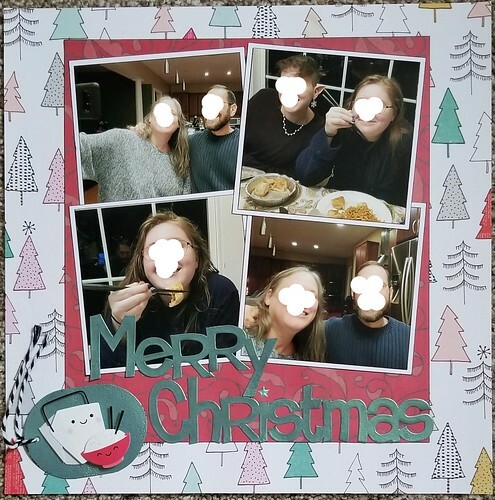 The fun papers you chose look so great with your family photos. 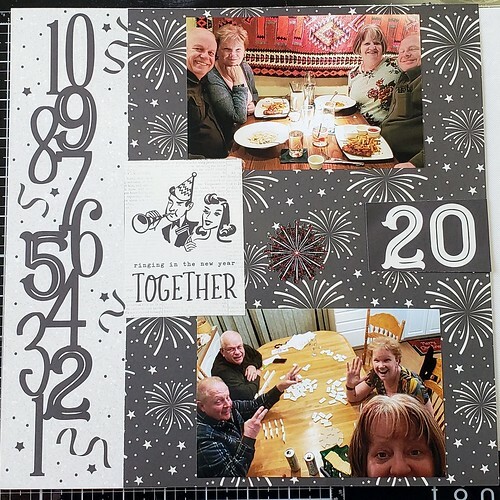 I really like multi-photo scrapping, and I like the way you're able to use your space so efficiently and still come up with really nice balanced designs. Chinagirl828 , such an elegant page! All those beautiful delicate elements! jloubier , I love all the different patterned papers you used on your pages. It's almost like a quilt. Looks like you had a perfect day for your orchard trip! 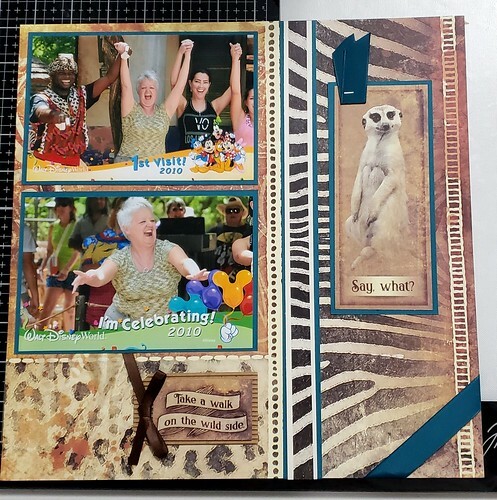 julieinsweden , love the bead swirls so much - and the black swirl journaling card works great with them. Beautiful pages. I'm so glad you're posting your work with us! dasmith2, Perfect background for the photos! I love the bold yellow accents too. Love all the views of the people and water tower, elaynef, and great job getting all of them onto two pages! I want to step right into that photo on the right... so green and lush! Also love how you have been using venue brochures for logos and information on your pages. Good to see you are scrapping, msliz. Left you love in the Gallery for your fun pages. Hoping that you are now back into the flow and that we will see lots more! snow challenge today. no snow here yet this year, but at the grands house. I dug out my snow stash and found this really old frame...and I wish I hadn't. It totally overwhelms the pic even though I have redone it to death today, trying to calm it down. got another one almost like it...going in the trash! 13 pts for this one. I posted about our tabernacle on pokey peas and someone asked where I got it...ours is really old, but you can buy them a lot of places on line. We didn't make it...came all done, but you can also buy kits. dh has used it a lot for many different lessons. the tabernacle has all the coverings that you can take off and look inside at the inner court, brazen alter, etc. There is an extra ark of the covenant...but there is one inside, too, with all the elements inside. The kids loved it when he had them tie a rope around the high priest ankle so he could be pulled out if he died while in the holy of holies! So here is my redo. Soooooooo much happier with the results. I added some more dots (most are with the hidden journalling) and some new glitter alphas. Redo. Share and doing a challenge. So 5 points. You have to click on the arrow to see noth pictures. Oh ladies! All of your LOs look beautiful! I haven’t touched my supplies all month. I started up a blog and it has consumed my time a bit more than I expected. Between that, family and daily chores I just haven’t had the time or energy! I’m hoping to find the time tomorrow! I think that whatever you did to that frame, elaynef , it works WITH your photo on this page. I like the touches of purple that highlight the kids' jackets/scarves. Good job taking on the SNOW challenge from where you live! 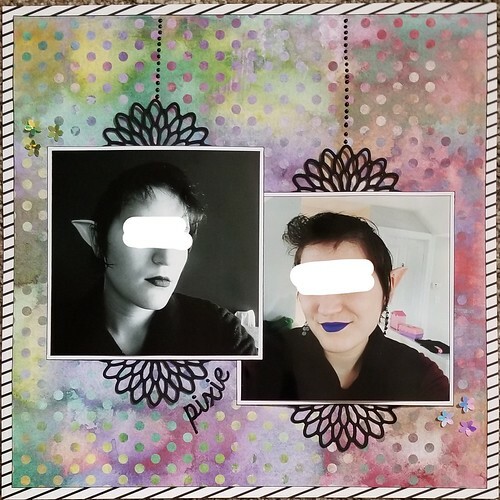 The redo is great, julieinsweden . Changing the angle a bit and toning down the background really puts the focus on that little sweetheart and her love of clothes! No pages or cards for me today. I am still working on getting all my Christmas supplies stuffed back into their cupboard. Did some on Friday and will do some today. Must remember to claim points for organization--although "organizing" is a euphemism for what I am doing. The only thing remotely left brained is that all things in that corner cabinet will be Christmas related! 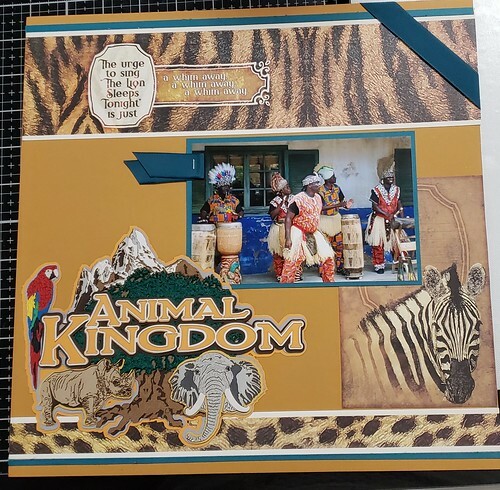 If you are looking for additional inspiration for your crafting pleasure, crystalb has posted a Long Weekend Kit Challenge Check it out! Linda, your new years cards are adorable. What a cute idea to send New Year cards! Curry is Amazing: Perfect color scheme for a page about curry. Not that I would expect anything different from you. The dish looks amazing and makes me want curry now. I love the title work! elaynef, Photos for Popsicles: Such cute photos and love the popsicles. You did fantastic with your first ink splatters! I love Christmastime: love how you tied your past to your present. Summer Nights: had to fave this layout. NYE 2017: fabulous color scheme and wonderful embellishing. Happy New Year: seriously so much to love on this page. Santa's Nice List: had to fave this one. Merry Christmas PJs: love the contrast with the silver paper. 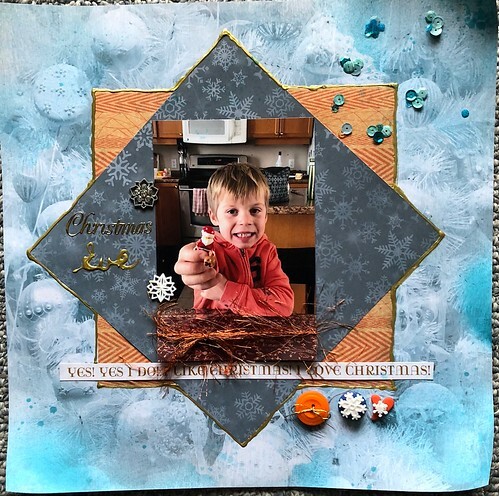 Merry Traditions: Fantastic cluster work. December Wedding Card: I really want to run my hands over all that texture. Snuggle up: Soft snowflake background made me think it would be nice to curl up with a blanket and a book right away. Merry Christmas - Game On: had to fave. 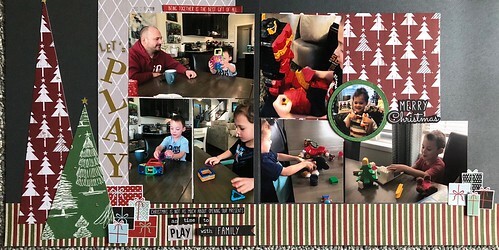 Holiday Details Album: everything I would expect from you - completely beautiful and stunning! Incognito: laughed out loud at that. Totally something my dd would do. I love everything on this page. The penstitched border, mixed media background, the doodle art, the frames. Fabulous! KelleeM, First I love that you added the capital M at the end of your name as I've always pronounced your name in my head as if it's all one name, even though I know you're Kellee. But it's been years of smooshing it in my head, so I'll probably continue. lol. Happy Anniversary to Us: How fun to have a NYE wedding!! I love how you captured your anniversary here with all the gold and you made it work flawlessly together. This is a really beautiful page! Everyone has a story to tell: Love this and am totally going to have to make my own version of inspirational quotes. Thanks so much for the inspiration! Pierced ears: (((Squealing for cute baby photos))) love the softness and femininity on this page. Cousins: Love your clusters. Great colors too. On page 2, but being called away to snuggle with ds and watch Indiana Jones. His computer is in the shop and I'm taking advantage of him being available to me. 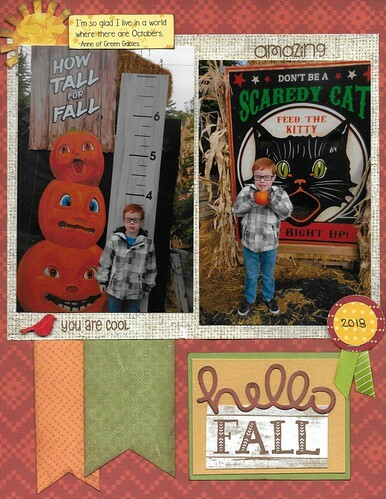 A couple more Pumpkin Patch layouts. Points totaled on other thread. Be back later to chat. Why do I do this? I just lost a long post. Someday I will learn! elaynef, I like the frame you used on your Snow Challenge. Give it a few days and I think you’ll decide you like it. I love the design and the way the title and year pop. Also, thanks for the info about the Tabernacle. I had to go look up more information about it. I loved, and I’m sure the boys loved the rope on the foot. So interesting. ~ I love your Family Memories. I especially love the small photos of you and DH relaxing together. Those boys will remember this outing for the rest of their lives. Great job on the collage of the 3 photos together on the 2nd page. No question that memories were made with grandma and grandpa. msliz, it’s great to see you doing a bunch of scrapping. I left you love in the gallery. Do you have your scraproom back, or are you scrapping elsewhere? julieinsweden, I love your Diva page. That little gal is so adorable. The glitter and bling are perfect for this layout. I love the bright background paper and I agree that this is “fabulous”. Is she a redhead? I am partial to gingers because 5 of our 14 'grands' are redheads and 2 married redheads. Thanks for sharing your layout! I hope I haven’t skipped anyone. If so, it was unintentional. I am really enjoying all the layouts and projects this month. Thanks grammadee, stinkerbelle and others who have started these challenges. The ideas in the challenges are keeping me going. I so appreciate the time you have put into this! julieinsweden loved your diva page...what a cute, cute, cute little girl! Great Pics, Nylene and love your straight, simple style that let them shine . and seeing your little redheads is always a delight! And then there was the one with the snake that matched his hair...love it! elaynef, you are killin' it, this month! That Family pp line is one of my favorites and you are using it fantastically! Love how you placed the scalloped border strips in unexpected ways. And your animal pages are really cool. Love how you balanced the grid page with one with larger photos, and again, love your use of signs. 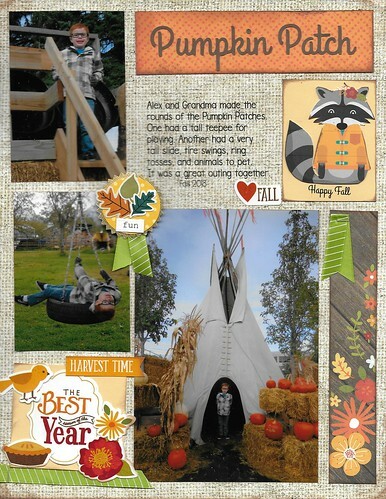 nylene these are darling autumn pages! Will look at them in more detail in the Gallery. patin - you have such different papers and embellies! I have never seen them before!